As I indicated in the last post that Jesus didn't die on the cross. Here are the proofs in very brief. They can be more lengthy explanations, but i have tried to give ref. only from the New Testament. Because of volume and time i reduce them into as brief as possible. I ask God's grace for the realization of the truth. 1) Jesus remained on the cross for few hours only (according to New Testament it was approximately 3 hours, from noon till three). The death by crucifixion takes time, as it’s a painful but slow death. 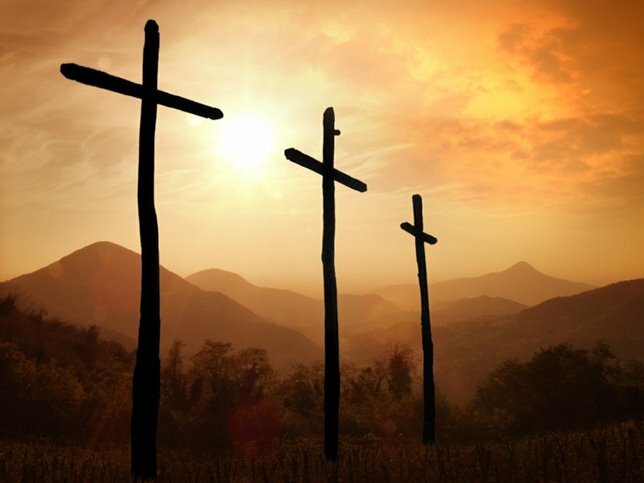 2) The two men crucified with Jesus were still alive when taken down from the cross. 3) The breaking of legs was done to the two criminals, but dispensed with in the case of Jesus. 4) The side of Jesus was pierced and blood rushed out which was a sign of life. 5) Even Pilate didn’t believe that Jesus actually died in so short time. 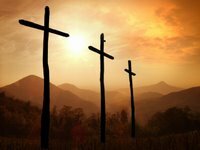 Read here Mark 15:44, Pilate was surprised that he was already dead (because they knew very well that so quickly a person can not die on the cross). 6) Jesus was not buried like the two criminals, but was given into the charge of a wealthy disciple of his, who lavished care upon him and put him in a spacious room hewn in the side of the rock. Very much likely that Jesus was given Essenic healing to recover in those three days before he was again seen in the garden. 7) When the tomb was seen on the third day, the stone was found to have been removed from its mouth, which would not have been the case if there had been a supernatural resurrection. 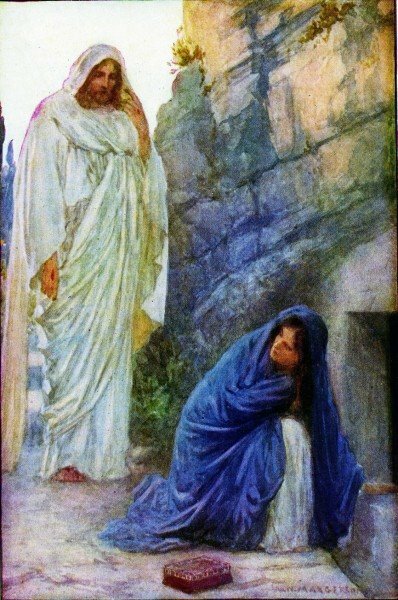 8) Mary Magdalene, when she saw him took him for gardener (John 20:15), which is only and only because Jesus disguised himself as a gardener. Such disguise would not have been the case if Jesus had risen from the dead. 11) Jesus Christ undertook a journey to Galilee with two of his disciples walking side by side with him, which shows that he was flying for refuge, for if his object had been to rise to heaven he would not have undertaken a journey to Galilee. Read in Luke 24:14 that Jesus himself was walking in disguise with the disciples who even didn’t recognize him at first. 12) In all post-crucifixion appearances Jesus is found concealing and hiding himself as if he feared being discovered. 13) Jesus prayed the whole night (before his arrest) to God to be saved. Read in Matthew (26:39) Jesus prayed this beautiful prayer to save him, “My Father, if possible let his cup (which symbolize suffering and death) pass from me! Yet not what I will, but what You will.” Ponder carefully about the words. These are the words of total surrender of a devotee to the Beloved and Jesus not having any father used to call God as his father. 14) His prayers were answered by the Lord in Heaven and it was a splendid way Lord saved Jesus. This is most probably what happened (God knows the best), Jesus was made to carry the cross (John 19:17) and was beaten severely with a whip before prelude to crucifixion, known to the Romans as verberatio mentioned in Matt 27.26, Mark 15:15, John 19:1. As result he became weak from trauma and loss of blood. He didn’t sleep the night before as he prayed deeply to God (and few nights as well as he was moving constantly). And also due to the pain and trauma at the cross Jesus lost consciousness and went into a coma. The enemies of Jesus thought he died. He was taken down by one of the disciple. (This is exactly how the plan of God executed in His grace). But in actuality Jesus was taken care very carefully. Most Probably he was given healing by the Essenes. The Essenes called themselves Therapeutae, "healers," claiming that their austere lifestyle gave them the power to cast out demons of sickness and even to restore life of the dead. Considering this, Christ raising Lazarus from the dead seems a typical Essenic miracle. And similar method was applied to him to bring him back to consciousness. He gained back his consciousness. Took disguise as a gardener and this is when Mary Magdalene saw him, she couldn’t recognize him. And after recognition, when Mary wanted to embrace him in clear voice Jesus said, “I have not gone to Father yet”. Going to Father means journey after death. This clearly signifies that Jesus himself said that he didn’t die (offcourse church has its own interpretation). Jesus most probably left Jerusalem leaving the work to James and Mary Magdalene. And where did he go? Research shows that Jesus went to India. And it was not for the first time he went to India. Many scholars believe that Jesus went to India even before. The time of his life about which all the gospels are mysteriously silent is the time we are talking about. Many of the philosophies that Jesus talked as discovered in Gnostic Gospels and other Mystic Gospels, it is more clear that Jesus had influence of Eastern Thoughts. And many believe he learned them from the Buddhist and Vedantis (Hindus) of India where he spent some part of his life. The second coming of Jesus and how it might happen is also interesting. What Da Vinci give hints (about the blood line of Jesus Christ) may well have relationship with the second coming. But for that part you have to wait for some more days. I will try put more info about Christ’s going to India in the next post. There are life long researches from many scholars on the topic as well. The chruch teaches that Jesus ascended to heaven, which if happened in reality would be given in great detail to strengthen the faith of the believers in Jesus. But such a supposedly magnificent event is writteen just in few lines. Thats something to ponder. 24:50 Then Jesus led them out as far as Bethany and lifting up his hands, he blessed them. Now during the blessing he departed. Look carefully in New Testament the following line, “and was taken up into heaven” was not even in the original text and its written in footnote. It was added later on to make false doctrines. Now Jesus himself said that he was not ghost (Luke 24:38-39) or spirit in his post crucifixion appearance. Yet Magdalene didn’t recognize him though she was a close companion and a beloved one. What does it indicate? Jesus was simply taking disguise to avoid re-capture and more chaos. Now continue reading pls, John 20:16 : Jesus said to her, “Mary”. May God bless Jesus and let you receive the truth in complete submission to the TRUTH. Amen.
. Witness the biggest cover-up in human history ... "only" begotten Son of God?